This was taken within Auchindrain, we think in the 1870s, on one of the fields worked by the McCallum family - that's Eddie McCallum at the horse's head. They are harvesting oats, and (mostly hidden) the horses are attached to a reaping machine. 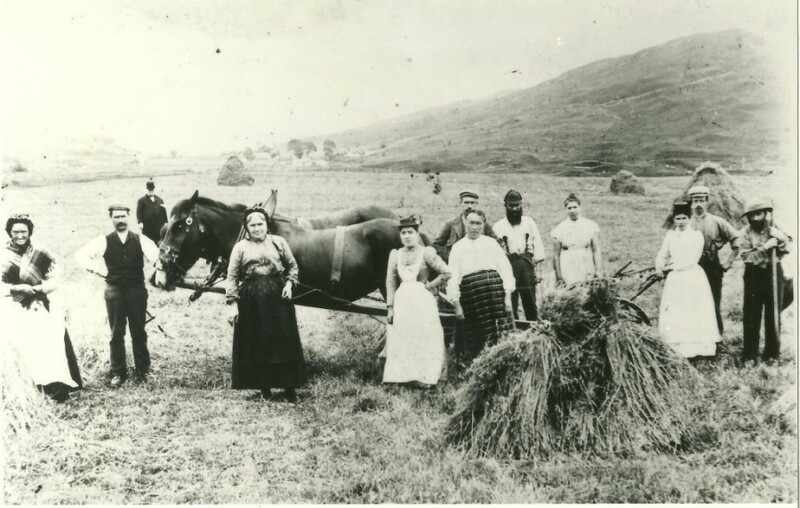 Of necessity, the women of the township were fully part of the workforce alongside the men, gathering the cut corn, bundling it up into sheaves, and stacking the sheaves into "stooks" like that in the foreground. It is believed that this, and one other image we have, are what remains of a photoshoot organised by the Duke of Argyll - the bowler-hatted frock-coat in the background is reckoned to be his factor, the Chamberlain of Argyll. The people of the township may have known the photographer was coming, or some of the women may have just refused to co-operate unless they could go home first, because two of the women are very obviously in their Sunday Best, with hats, in stark contrast to the working clothes with bare heads or bonnets of the others. Another indication of the "Sunday Best" is the length of the skirts. At a time when decency required that a skirt had a hemline just above ground level - which is what we see with Ms Puffed-sleeves-and-pinafore in the centre, when working the women of the township wore skirts to ankle level - the older woman centre-left - to keep the hem out of the mud.